In addition to Earth Day (April 22nd), this month is also Prevention of Cruelty to Animals Month. Cruelty-free products as well as earth-safe ingredients go hand-in-hand with protecting the environment and earth’s inhabitants, including our furry friends. Here are sustainable companies and products you should know about. MyChelle’s sun care products provide broad spectrum protection through mineral-based zinc oxide and titanium dioxide. Mineral sun protection ingredients reflect UV rays, while chemical sunscreens absorb rays. It is believed that mineral sunscreens are safer for human use and for the environment. Chemical sunscreen ingredients like oxybenzone and octinoxate put coral reefs and marine life at risk. These products aren’t biodegradable and can cause bleaching of coral reefs. Bleaching inhibits the growth of new coral. MyChelle’s sunscreens are also certified non-nano (some are concerned that nanoparticles from micronized zinc oxide and micronized titanium dioxide, can be absorbed into the skin and cause health problems, but this hasn’t been scientifically proven). MyChelle is a member of EWG Verified For Your Health Program because the products are also cruelty-free, non-GMO, and free of many chemicals like phthalates, parabens, artificial fragrances and colors. Info: mychelle.com. This southwestern clothing brand describes its responsible outdoor apparel as products with purpose. Keep Nature Wild says it has an obligation to protect our lands and to also give back. A portion of every purchase goes towards hosting clean up events and this averages to a pound of trash for every product sold. They also use ethical manufacturing. 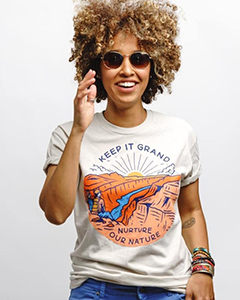 One hundred percent of the clothing like the Keep It Grand Unisex Tee (pictured) is manufactured in WRAP (Worldwide Responsible Accredited Production) certified facilities. The company also promotes volunteerism (promoting cleanup events), responsible outdoor recreation, as well as supporting and employing local businesses. Info: keepnaturewild.com. Natura Brasil is a sustainable, cruelty-free cosmetic company that is also certified as a B-Corporation (for-profit companies certified to meet rigorous standards of social and environmental “performance, accountability and transparency”—displaying responsibility to the community and to the planet and not just the bottom line (and shareholders). Packaging is either recycled or recyclable. 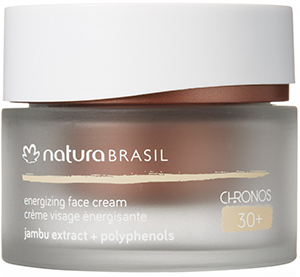 Products have mostly plant-based formulations, using ingredients from the Amazon such as Brazilian Jambu extract in the Chronos Energizing Face Cream that acts on the first signs of aging to hydrate the skin and minimize fine lines and wrinkles, or Firming & Radiance Face Cream for mature skin, which contains Brazilian Jatoba extract and amino acids to deeply moisturize and firm skin and restore skin’s radiance. Info: naturabrasil.com. Sur La Côte prides itself in making clothing from ethical sourcing and manufacturing. The garments are made from sustainable micro-modal fabric made of renewable natural fibers derived from wood. Micro-modal fabric is said to use less water consumption than cotton and is sustainably harvested from beech trees. The fabric like the Mallorca Pant (pictured) is luxuriously soft and typically used for underwear and loungewear, making the styles, which include resort pants, dresses, skirts and tops, comfy and cozy. In addition, they print all branding and care instructions on the inside of the clothing instead of removable tags that are typically tossed into the trash. Shipping is 100 percent plastic free in compostable bags. Info: shopsurlacote.com. 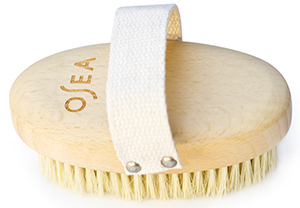 If animals are a part of your concern for the environment, OSEA has created a dry brush that is a vegan, cruelty-free alternative to natural bristle brushes, which are sometimes made with boar bristles. Daily dry brushing helps exfoliate skin and break up toxins, enhancing blood flow and circulation for radiant skin. The Plant-Based Dry Brush has a beechwood base (beechwood is considered more sustainable than a wood like oak, because they are a replaceable, fast-growing tree species) and plant-based sisal fibers, which come from the agave plant. The brush is for all skin types. Info: oseamalibu.com. T.L. Brooke is a New York City-based sustainable fashion brand of Timothy L. Westbrook, the January designer for Pildora’s #Fashionability: Designer Spotlight Series, that honors designers of sustainable, eco-friendly fashions. T.L. Brooke Umbrella Raincoats and Mod Jackets are re-made in the USA from fabric of discarded umbrellas. Each one represents five pounds of materials prevented from entering landfills. Once fabric is removed from umbrellas, the metal, plastic and wooden elements of umbrellas are 100 percent recyclable. Some fabrics are woven from magnetic ribbon of audio cassettes and salvaged cotton, along with other recycled fabrics, some of which come from Fabscrap, a non-profit that recycles textiles. 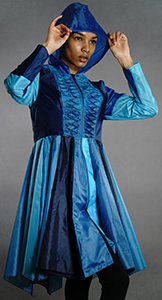 In addition some of the garments are sewn on non-electric sewing machines in Brooklyn. Info: tlbrooke.com. As you travel, make sure your body and the environment is safe. Love Sun Body sunscreens are free of hazardous ingredients and are vegan and cruelty free. The products are certified by Ecocert for meeting the COSMOS (COSMetic Organic & Natural Standard) meaning it meets the standards for organic and natural products in Europe, and so far the only sunscreens in the U.S. certified by Ecocert. The products are biodegradable, coral reef safe, and the packaging is recyclable. 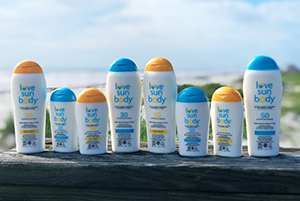 Love Sun Body Lightly Scented SPF 30 is 100 percent natural origin mineral sunscreen, providing broad spectrum UV protection and is water resistant for up to 80 minutes. It is lightly scented with tiare (a flower in the South Pacific that has a scent reminiscent of coconut) and vanilla and contains non-nano zinc oxide. Info: lovesunbody.com. Everyday Yoga, is Yoga Outlet’s first-ever performance yoga apparel line. The Harmony Collection garments are made from recycled fabrics and from materials manufactured and developed only in certified eco-friendly factories. The pictured High-Waisted Go-to Pockets Leggings and Twisted Layering Tank are made from recycled polyester material sourced from post-consumer plastic bottles to help lessen negative impact on the environment. 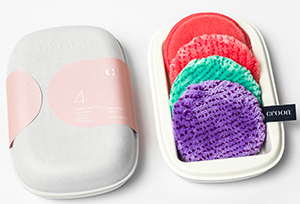 Croon is a natural beauty brand that has a line of reusable cleansing and exfoliating pads to replace traditional disposable face cleansing wipes that can take up to 100 years to decompose. The Croon pads are made of superfine microfibers designed to lift, trap and remove dirt, oil and makeup. The pads are machine washable and last up to 200 washes (about two years). The product has been given 5 stars by DermaTest and the Oeko-Tex 100 label for sustainability, created in a manufacturing environment that minimizes carbon dioxide emissions. Croon is available in three different sets including the Essentials Kit (1 exfoliating fiber, 3 cleansing fibers and a washer bag). Info: justcroon.com. This luxurious line of sustainable clothing was developed by Jacqueline Sacks in an effort to ease her children’s sensitive skin issues from irritating fabrics. Sacks eventually developed a method for softening fabric and came up with Saint Haven Soft™ a soft, breathable non-toxic fabric. The Saint Haven brand works with ethical manufacturers using eco-friendly, all-natural and chemical free fibers made from sustainably grown beech trees. Fabric is soft, machine-washable, and “snuggle quality,” so you can ditch the sweatpants as comfy wear for the Women’s Relaxed Pant, which is also anti-microbial and hypoallergenic, with no tags, buttons or itchy seams. Info: sainthaven.com.